Place the frozen yeast rolls on a baking sheet and defrost according to package instructions (mine was covered for 3 hours). 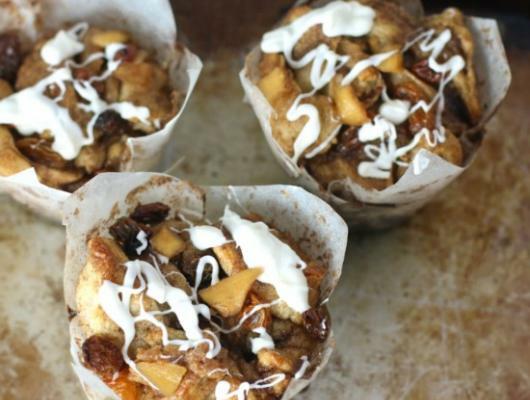 Preheat oven to 350° F. Line a muffin tin with paper liners and set aside. In a small bowl, mix together the brown sugar, cinnamon and sugar. When the dough has finished rising, grab 1 tablespoon worth of dough and roll into a ball. Dip the dough balls into butter and then roll into the cinnamon sugar mixture. Fill each muffin liner with 3 dough balls. Sprinkle a little bit of apple chunks and raisins on top of the dough balls (saving a little to sprinkle on top too). Repeat the dough ball dipping and divide them among the liners. If you have a few extra, stick them onto some of the other muffins to make them larger. Meanwhile, make the glaze by beating together the cream cheese, powdered sugar, vanilla and cream together. If it's too thick, add more cream. Drizzle each muffin with glaze and enjoy! 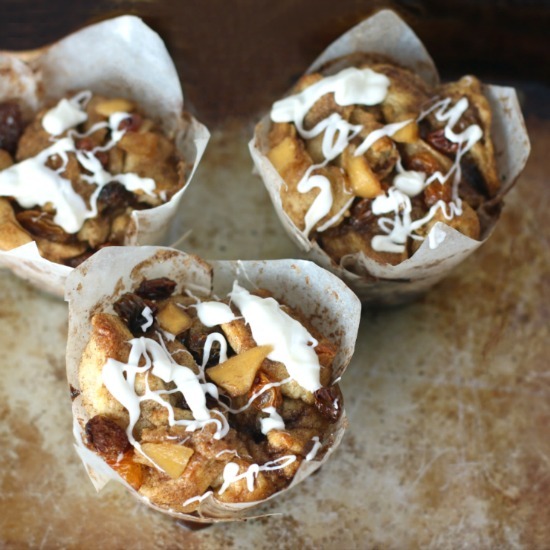 These Apple Cinnamon Roll Muffins are soft, buttery, gooey “cinnamon roll” tasting muffins that are delicious and super easy to make!